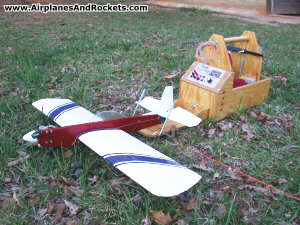 The Sig Akromaster control line airplane is another model of which I have had more than one. My first Sig Akromaster was built sometime around 2000, while living in Colorado Springs, Colorado. 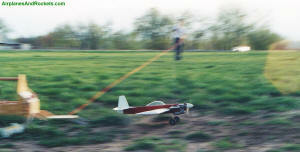 The Akromaster uses a simple profile fuselage with a built-up wing, and takes a .15 size engine. 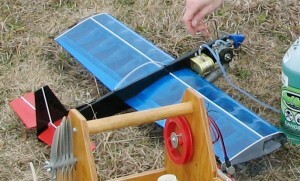 I had an OS .15 RC engine on hand, so it was installed with the throttle wired in the fully open position. 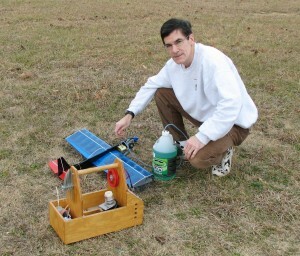 The power output was nothing to get excited about, but was enough to allow it to perform most maneuvers. That poor model took quite a beating from the many times that I would just barely not make it out of a maneuver from misjudging altitude. It never had a major ramming into the ground, but the vertical fin has been reattached a few times, the wing patched, the canopy is long gone, the landing gear bent nearly straight back, along with various other insults. At some point I got tired of wiping off the oil and gluing everything back together, and threw it away (after removing the engine). The OS .15 engine was sold recently at a swap meet. After a few years' hiatus from control line flying, I decided to buy and build another Sig Akromaster. This time a Norvel .15 C/L engine was purchased to mount up front. I figured that if it was worth getting into control line stunt again that this time I'd do it right. Great care was used in the construction to keep it light. 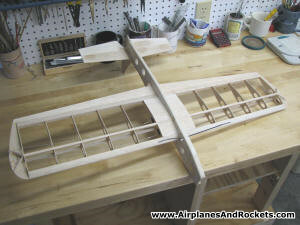 Lightening holes were drilled in the fuselage using very sharp Forstner bits to get clean holes. 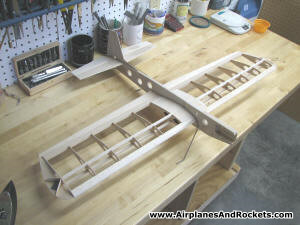 Since the model tends to build nose heavy, I was sure to remove both plywood and balsa from the nose area. The version with the transparent blue Monokote wing is the final result. It ended up about 2 ounces lighter than the first one. The Norvel .15 BB was broken in per the manufacturer's recommendation at home, and then the Sig Akromaster was taken to a local junior high school field to fly. 15% nitro Cool Power fuel was used. For some reason I had a hard time getting it run reliably in all flight attitudes with muffler pressurization to the fuel tank. I checked all the normal suspects for the problem, like leaky fuel line, crude in the fuel line, etc, but no problem was found. Finally, I just removed the pressurization line and it ran like a champ. The Akromaster was flying on 52' steel lines, and it was tearing holes in the sky pretty well. It was smooth as silk in all attitudes. After a half dozen flights, I decided to finally try executing a cloverleaf. The result was not beautiful, but it actually fit the definition of a cloverleaf. Finally, after 30 years, I had pulled off a cloverleaf! It similarly pulled through vertical figure eights and everything else in the book. I am far from a contest level control line pilot, but this really gave me confidence that it was not out of reach with a lot of practice and a high level airplane. 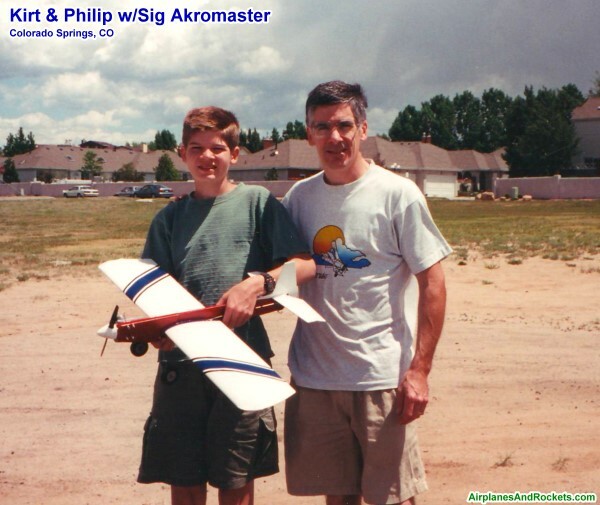 Probably because of the Sig Akromaster not having flaps, it was impossible for me to do any of the maneuvers that require square corners. 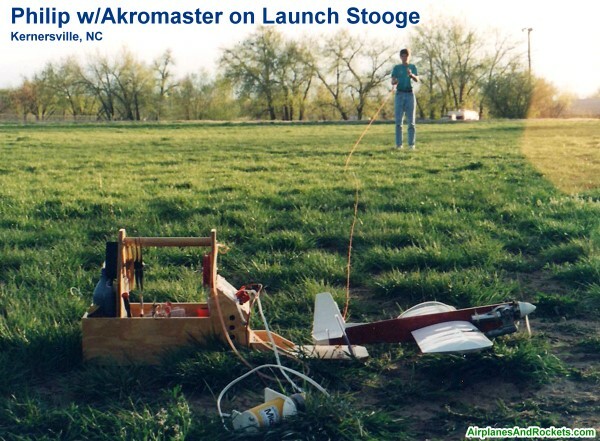 You can see in the photo below the Akromaster sitting on the detachable launch stooge that I built into my custom-designed Chameleon Field Box™. To the right of that is the Akromaster after just being released from the launch stooge. It worked very well.